Then the leaders tried to arrest [Jesus]; but no one laid a hand on him, because his time had not yet come. Many among the crowds at the Temple believed in him. "After all," they said, "would you expect the Messiah to do more miraculous signs than this man has done?" 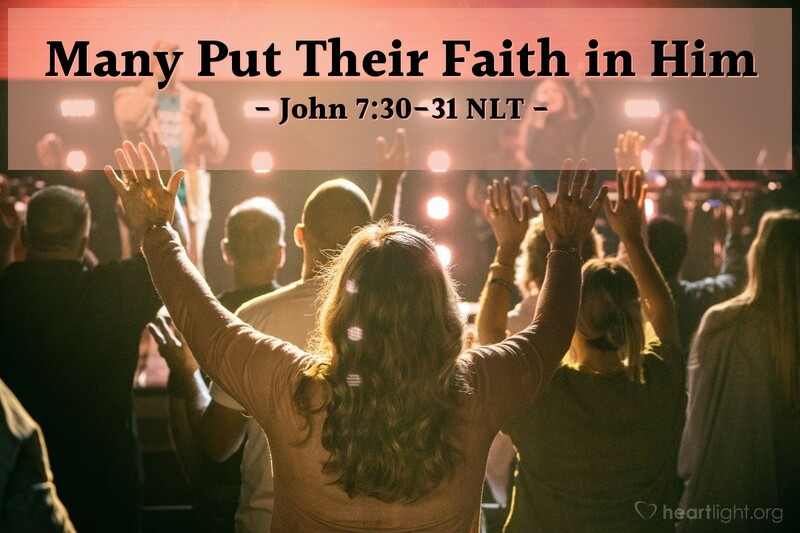 Even with pressure from the authorities not to believe, many put their faith in Jesus. Why? They saw what he did and recognized that there had to be a divine power behind it. When unbelievers look at our churches, the body of Christ, what do they see? Do they see compelling deeds that cry out that God has to be behind what is being done because otherwise, we couldn't do what we do? Or, do they see predictable "church stuff"? Jesus promised that we would do even greater things than he did. So let's go out and be what he called us to be and do the life-changing work of the Kingdom and not just the housekeeping work of "churchiness." Dear LORD, God Almighty, please ignite my congregation of Christians and me in particular to a higher calling and a bigger vision of what you want to do with us. Use us in our community, and beyond, to do the work of Jesus, and use us in ways that we don't even think are possible. Most of all, dear Father, help your work through us to lead others to believe. In Jesus' name, I pray. Amen.